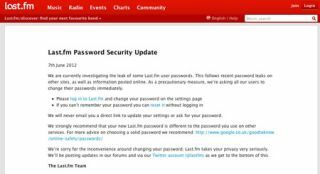 Last.fm investigates password security breach | What Hi-Fi? First it was Linkedin, and now users of music website Last.fm may have had their passwords hacked. Last.fm is investigating the leak of "some" of its members' passwords. A message posted on the site's security page advises all its members to "change their passwords immediately". The company has apologised and says it takes user privacy "very seriously". "We will never email you a direct link to update your settings or ask for your password. "We strongly recommend that your new Last.fm password is different to the password you use on other services."